SW Florida real estate home prices aren’t quite back to what they were in January 2006 however Southwest Florida home prices rise to highest level in years. 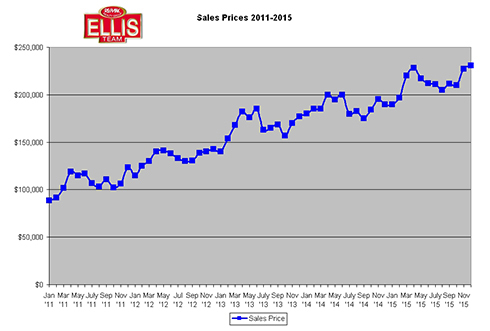 December 2015 median home sales price in Lee County came in at $231,000 which was a 21.6% increase over sales in 2014. Average sales prices rose 17.2% up to $333,735 in December. While overall sales fell 2.8%, cash sales fell 10.8%. We don’t really have an explanation other than as prices rise we tend to see more financed sales. Each year listing inventory increases starting in January but this year we actually saw a 4.2% decrease. January started out strong. Typically sales don’t pick up until about January 18th or so, but this year it was early. If anything we perhaps saw a slowdown in the 2nd half of January. Perhaps this was reaction to major stock market corrections? We don’t know, and we hesitate to get caught up in sales activity over a one or two week period. January isn’t the biggest month for sales anyway. Sales tend to build in season. February becomes a very strong month and March builds on top of that. Mortgage rates have actually fallen with all the financial turmoil, so buyers may benefit from that when they go to purchase. Official year end stats for 2015 won’t be released until February 17th, so we’ll wait and report that breaking news on our Blog that day. You may wish to subscribe to our Blog so you don’t miss it. We know year end prices will be up; it’s just a matter of how much. Sellers like to know as it forebodes next year’s tax assessments. It also gives sellers a good idea in case they are considering selling. If you’re considering selling you might like to check our the Market Reports section on our Southwest Florida MLS search website We wrote about this new feature last week and many signed up to receive real-time reports of active listings, pending sales, and solds in their neighborhood. If your neighborhood isn’t listed yet, you can create your own. If you’re a buyer, you can use our website to search for properties. Buyers love it because it’s updated every 5 minutes. It’s fun as a Realtor to make a change in MLS and watch it update on our site in just a minute or so. A lot of national websites don’t update or don’t have all the listings, so buyers get frustrated when the home that interests them isn’t there or sold months ago. That won’t happen on our website as long as Realtors have updated the MLS. While buyers love shopping on our site, there’s no substitute for sitting down with a knowledgeable professional who will listen to your needs and make suggestions. People who are not from here feel at a disadvantage because they don’t know the area. They want local help from someone who cares and knows the area. That’s where we come in. We’re the Name You Know. We don’t try to sell you anything. We just educate you on the market and guide you in the right direction so you can make the best decision for you. The Ellis Team is growing. We’d like to welcome two fantastic additions to our team. Ashley Johnson and Alisha Swientek have joined the team as buyer specialists. Both bring a wealth of real estate experience to the team. They look forward to helping you find your dream home, along with Kevin Ellis and Chris Herrington. We are deeply proud of each of our team members as they share our values and goals of helping our customers buy or sell the perfect home for them. Posted in Cape Coral, Cape Coral Real Estate, Fort Myers, Fort Myers Beach, Fort Myers Real Estate, Southwest Florida Real Estate.Tagged home sales price in Lee County, Market Reports, Southwest Florida Home Price, TRID.